So let me explain, what you have just read is word-for-word the ridiculous Seinfeldian exchange that we had with our waiter as we were leaving Mimi’s Cafe today. This took place after my husband and I had an even more absurd 15-minute debate over how to interpret the soup advertisement on our table. 1. I can have soup for $5 if I spend $5 on something else, but if the wait staff doesn’t try to upsell me on getting “the large size” version of the soup, then it’s FREE. 2. I automatically get a FREE soup to-go (normally $5) with any $5 purchase. If they don’t suggest I get “the large” then they upgrade me to the large for FREE. 3. Two separate messages altogether: a) You can buy Mimi’s Soup To-Go! at a special price of $5 if you spend $5 on something else. b) If they don’t suggest we buy a large Soup To-Go for $5, then it’s FREE. 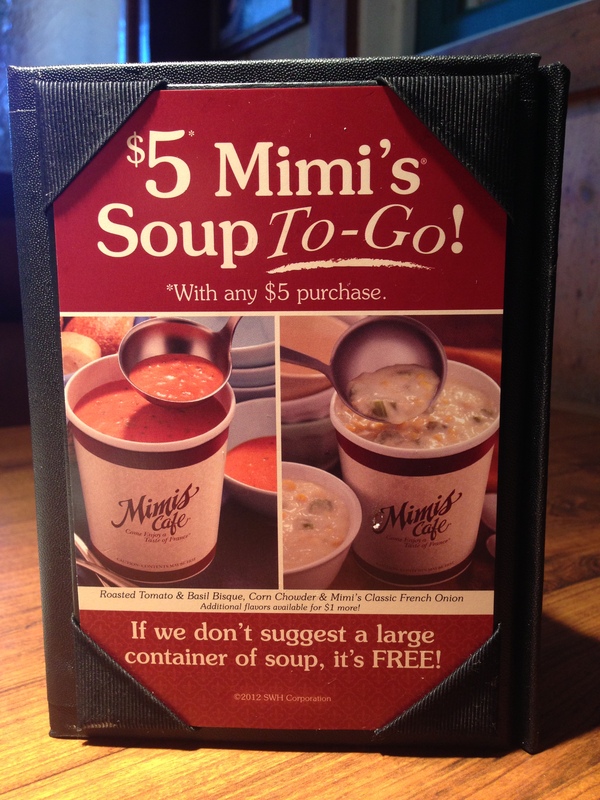 Oh and by the way, the correct meaning of the ad, as far as I can tell, is that Mimi’s is now selling $5 containers of Soup To-Go. If your wait staff doesn’t suggest you purchase some soup to-go before you start to leave, and you call them out on it, then they begrudgingly have to give you a large soup to-go for free. It’s important to note that based solely on the reaction from our waiter, if they give out too many free to-go soups they get in big trouble, or so we assume. My advice, skip the soup and stick with the all-day breakfast menu. 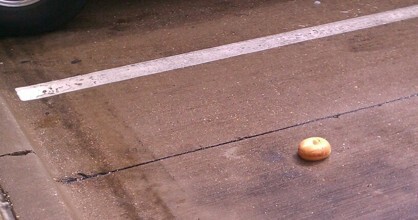 It’s yummy and far less confusing. This entry was posted in Creative, Hmmm... and tagged advertising, copy, Mimi’s Cafe, nazi, soup on March 3, 2013 by Parking Space Bagel.